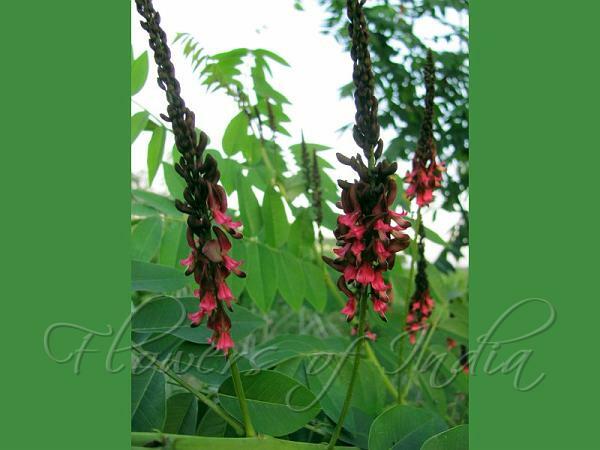 Zollinger's Indigo is shrub or small tree, erect, 1-3 m tall. Stip­ules are narrowly lanceshaped, 5-8 mm, falling off. Leaves are 20-25 cm, 11-19-foliolate. Leaf-stalks and rachis have appressed white and brown hairs. Leaf-stalks are 2-2.5 cm, rachis flattened and adaxially grooved. Leaflet-stalks are 2-3 mm, leaflets blades opposite, ovate-lanceolate, 3-6 x 1.5-2 cm, papery, base rounded to broadly wedge-shaped, tip long-pointed. Flower racemes are 7-13 cm, densely flowered; carried on stalks covered with rust-colored hairs. Bracts are lanceolate, about 1.5 mm. Flower-stalks are as long as bracts. Sepal cup is 1-2 mm, with dense appressed grayish brown hairs, tube about 1 mm, teeth triangular, about 0.5 mm. Flowers are white or purple, standard ovate-lanceolate, 6.5-8 mm, wings as long as standard, margin ciliate. Keel is 7-7.5 mm, outside with dense appressed brown hairs. Sta­mens are 5-6.5 mm. Seed-pod is cylindric, spreading, 2.5-4.5 cm x 5.5-6 mm, sparsely hairy, endocarp blotched. Seeds are 10-16, dis­c-like, about 2 mm in diameter, arranged like a pile of coins. 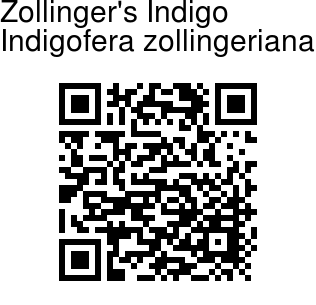 Zollinger's Indigo is found in China, Bhutan, NE India, Andhra Pradesh, Gujarat, Karnataka, Kerala, Tamil Nadu, West Bengal; Sri Lanka, Andaman and Nicobar and SE Asia. Flowering: June-September. Photographed at Rainforest Research Institute, Jorhat, Assam.